Making sidewalk chalk paint is a classic summer activity. Messy and fun, it’s a great way to get kids writing as well as exploring color and creativity. Even better, it’s easy to make! When the days are warm and sunny, but not too hot yet, we love to spend time outside with sidewalk chalk. When that gets old, you can bump it up a notch by trying out sidewalk chalk PAINT! After a little trial and error (and a big mess in my kitchen!) I’ve decided that this is my favorite, easiest version. All you need are 3 ingredients that you may already have at home in your kitchen. I’m giving you two ways to make this, depending on your needs. Either way, you’ll want medium size paintbrushes or small foam brushes once the paint is ready. If you want to make just one color, simply mix the above ingredients. Voila! 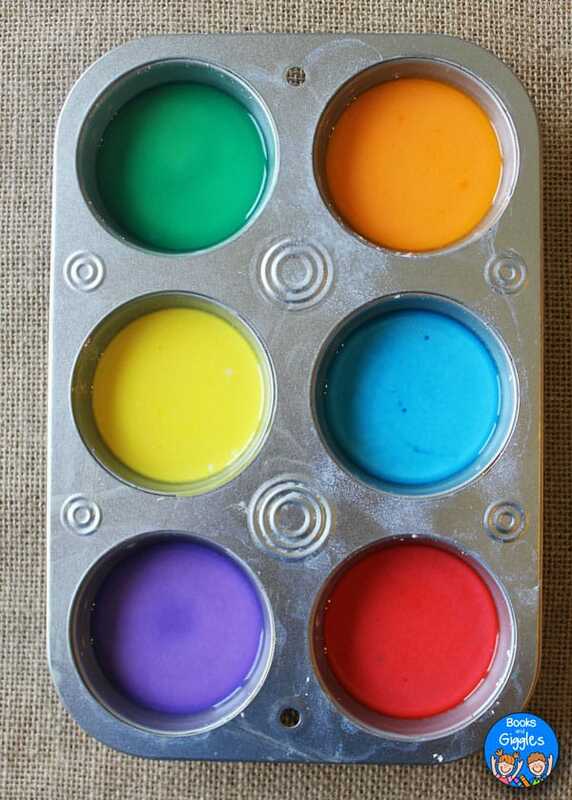 If you want to make six colors at once, the fastest method is mixing the cornstarch and water first, before adding any color. Put the cornstarch into a 2-cup liquid measuring cup, and then add the water and stir well. Add 5 drops of food coloring to each cup and stir well. You may like to leave one cup white. The color does settle after a while, so remind the kids to stir. Also, you’ll want to provide a cup of water to rinse the paintbrush between colors, or you can set out one brush per color. Oh, and one more note – because of the food coloring these paints may stain some fabrics. Make sure the kids are dressed for messy fun! 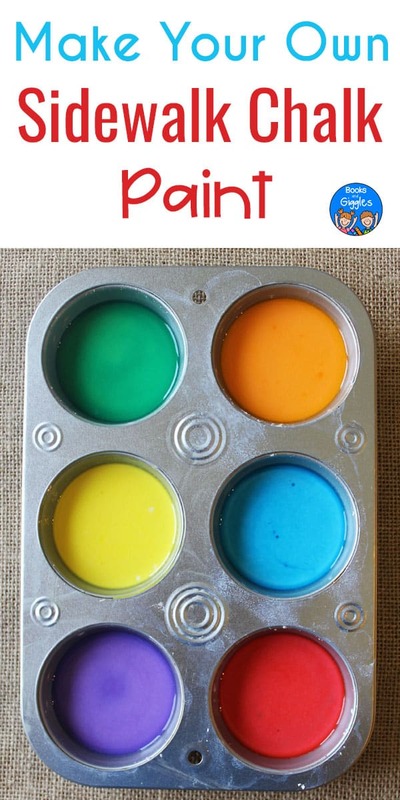 The kids can practice writing their letters or sight words, draw a picture, or experiment with mixing colors. 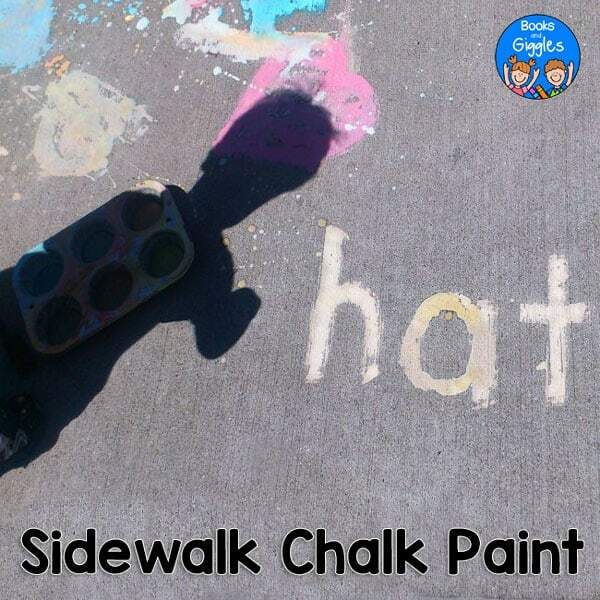 You may also like to introduce one of these engaging educational sidewalk chalk games. One more activity to try is to write letters or words with regular chalk, and then have the kids brush over your markings with sidewalk chalk paint. Finally, if the weather turns rainy on you, this paint also works marvelously well on cardstock. It dries silky smooth and doesn’t smear as much as regular chalk.